Quoted by Panasonic as having a 16-million-pixel, four thirds sensor, the Lumix DMC-GX1 actually has 4592×3448 pixels, which means its maximum output is closer to 15.8 million pixels. The sensor’s size creates a 2x magnification factor when compared to a 35mm full-frame unit. It has the same design as the sensor used in the G3, but with an increased ISO sensitivity of 12,800. The aspect ratio can be changed between 4:3, 3:2, 16:9 and 1:1, with 4:3 giving the maximum output. 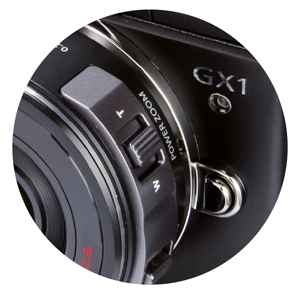 The sensor readout of the GX1 is 120fps, which is twice the speed of the G3 and GF3. This means the camera and lenses communicate faster, resulting in several benefits such as quicker AF speeds and shutter lag, measured here at a 0.09sec response. Like previous G-series models, the LCD screen is a touch type with full-area coverage. Touch control can be deactivated on-screen. Usefully, the main menu can be hidden in a tab on the right-hand side of the screen and features additions to the shooting controls. A frame rate of 20fps is available only with JPEGs at a reduced 4-million-pixel resolution, and up to a 1sec burst, while 4fps is possible in full-resolution raw + JPEG mode for a maximum of 2secs. More usefully, in JPEG Standard mode (at a reduced 4-million-pixel resolution), the 4fps burst rate is available for unlimited capture. Many manufacturers concentrate on the high frame rate rather than the length of capture, so Panasonic has introduced a practical feature here. The company offers good options for video, as AVCHD files are available in 1080/60i at 30fps, with stereo sound and the option for an external microphone. MPEG-4 format is also available. Panasonic has a couple of power-zoom lenses in its range that are ideal for video because they feature optical image stabilisation and zoom control for smooth zooming. As with the previous LVF1, the optional 1.44-million-dot LVF2 electronic viewfinder can be angled up to 90° for a more comfortable viewing angle, and gives a 100% field of view. 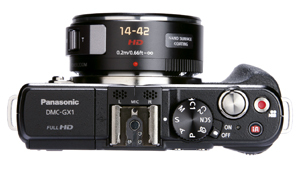 The panasonic Lumix DMC-GX1 can be bought in kit form with the regular 14-42mm lens or the new ‘X’-series Power Zoom optic. The benefit of the new lens is that it collapses to the size of a pancake lens when not in use. The disproportionate size between bulky zoom lenses and small compact system camera bodies has long been a criticism, but that does not apply in this case. The zoom of the lens is electronically controlled by a switch on the lens itself, or via Touch Zoom on the LCD screen. I have my reservations about an electronic zoom on a high-end CSC, because these lenses are typically found on compact cameras where the handling is less precise than with manual control. In this case, though, it gives a smooth and precise operation. Usefully, the exact focal length information is displayed on-screen while zooming, and the zoom can be stepped for a one-push shift between 14mm, 18mm, 25mm, 35mm and 42mm. In the main menu, the speed of zoom can be adjusted between low, medium and high, and set individually for stills and video capture. Typically, a slow zoom suits video capture well, but may not be suitable for stills photography, whereas a high-speed setting is ideal for stills. In short, the lens handles very well. We have not had the opportunity to assess the optical quality of the lens against the regular 14-42mm optic, but given its premium status and higher price tag we are led to believe that at the very least it is on a par with the older kit lens.